Our latest newsletter announces a sale on all green tea through April 15! Enter coupon code 6h5sgnzu at checkout and you'll receive a 10% on all green tea purchases, including some of our most popular: Organic Putuo Compassion, Cui Feng, Tai Ping Monkey King, Imperial Dragon Well, and more (the discount won't appear until you enter the coupon code). Help us make room in the warehouse for the incoming 2010 spring harvest, and take advantage of great values on some of our best teas of 2009 in a year when quality and availability of the 2010 crop is clouded by severe weather issues. The newsletter also previews Roy's upcoming trip to China and announces two great new green oolongs in the teahouse: 2009 Winter Harvest Imperial Green Oolong and Everyday Organic Green Oolong. Be sure to subscribe to the newletter so all the latest teahouse news and special offers arrive promptly in your inbox! Roy heads to China Monday for the spring green tea harvest. He'll have quite a challenge finding the quality and quantity of early spring tea Imperial Tea Court customers have come to expect, given the devastating freeze that descended on eastern China earlier this month. As if that weren't bad enough, there's a serious drought in Yunnan that's also affecting tea production and quality. One bright spot: high on Roy's agenda is a trip to Shaanxi, in western China, to sign the final papers to acquire a tea farm there. That deal plus his recent acquisition of farmland for a future tea farm in California makes Imperial Tea the only company in the world that will be growing commercial quantities of tea in both China and California. 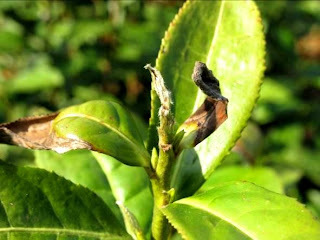 White tea, dragonwell, and most tea from Zhejiang may be delayed and the quality is uncertain. The quality of Imperial Green, bi luo chun, and Wuxi hao cha has not been affected by the weather, but quantities will be limited. Roy is packing this weekend for a month in China. He leaves early next week to supervise the harvest on some of the tea farms that are our longstanding suppliers. He'll also be frequenting wholesale tea markets in search of other interesting selections to offer customers. As always, he'll be blogging and sending photos with updates on this year's challenging harvest conditions and tales of his adventures in tea during the exciting, hectic weeks when the first teas of spring are produced. Green tea lovers polish up your gaiwans: the 2010 spring harvest will begin arriving in our warehouse in April. We'll let you know as soon as the new tea is available. Yesterday I drove up to the new tea farm property with Grace and Roy. It sits over the ridge to the east from Napa Valley, amidst fruit and nut orchards that have just burst into bloom in the spring sunshine. A mild breeze carried the scent of fresh grass and sun-warmed wildflowers, while hosts of birds darted and twittered in the trees and tall grass. Even apart from tea ambitions, it's a lovely place where you immediately feel the potent yet mellow, nurturing energy Roy often mentions. We couldn't brew tea there yet because the former owners aren't leaving until next month, but we did celebrate with a small thermos of uncommonly sweet and velvety 30-year-old puerh. You enter the property through impressive gates. The drive proceeds through an almond orchard lined with wildflowers. Roy will leave the orchard intact and grow his own tea snacks! There's a small house attached to a large workshop area that will become retail space. The wisteria-shaded pergola calls out to tea drinkers. One day, this slope behind the house will be planted in tea bushes. The property includes a large, professional greenhouse where tender young tea plants can get their start. Roy plans to grow lotus in the scenic pond. There's a footbridge to the small island. Beside the pond is an inviting picnic area, shaded with vines in the summer, that will be a relaxing spot for enjoying pots of fine tea. One of the many interesting birds on the property was this distinctively marked killdeer. 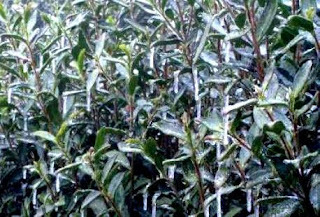 The latest word from China is that a powerful cold snap has spread snow, ice, and frost throughout eastern China as far south as Guangdong - not the forecast you want to read as the harvest approaches and tea plants are producing tender shoots. And there may be more bad weather on the way. One bright spot: it appears that Yunnan, in the far southwest, escaped the damage. Roy is hopeful that Shaanxi, where he's been offered a tea farm, is also out of harm's way. 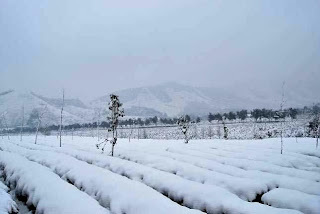 If you've ever wondered why springtime snow and ice is such a worry in tea country, take a look at these photos Roy's sources in China just sent over. The damage to the young leaves is obvious; in some cases, severe. Here's hoping the weather moderates quickly, before more of the early spring crop is lost. It's Official: Roy Closes Escrow on the Tea Farm Property! Thursday marked an important milestone in the history of Imperial Tea Court: Roy closed escrow on the 23-acre property here in Northern California that he's planning to turn into an active tea farm! We're all excited and can't wait to visit the site we've heard so much about. Now Roy has turned to making travel arrangements for his imminent trip to China to manage the spring green tea harvest, but he's hoping to write a blog post about the tea farm before he leaves. Once he's in China he'll be making regular posts about the harvest and the 2010 tea he'll be bringing back to the teahouse. The spring tea season is shifting into high gear! 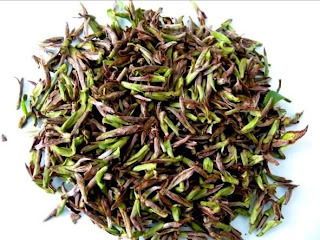 Word comes from China that the 2010 tea harvest is underway! They're picking tea now in Zhejiang and Yunnan, with none of the harsh weather issues that challenged the 2009 crop. Roy is receiving daily updates and will leave for China shortly after completing the transaction for his California tea-farm-to-be. We'll soon be providing more details on the outlook for your favorite spring varietals. Good news if you love black tea: there's a great new black tea in the teahouse, affordably priced and best of all, it's organic! Our new Organic Golden Tip Black Tea is delightfully fruity and flavorful, so delicious that you'll want to share it with your most honored guests, yet affordable enough to drink every day. Made from young leaves plus abundant furry tips oxidized to a brilliant gold, this handsome tea immediately impresses with its rich, fruity nose. It infuses to a deep amber liquor marked by notes of ripe fruit with tantalizing hints of smoke, and ends with a sweet, crisp finish. We look forward to serving you this tea on your next visit to one of our teahouses!